On the first Thursday of the month, the CAS meets from 6:45 to 7:15 pm to share and discuss society information and concerns. Following each meeting, from 7:30 to 8:50, is a critique of members' art by a guest artist. 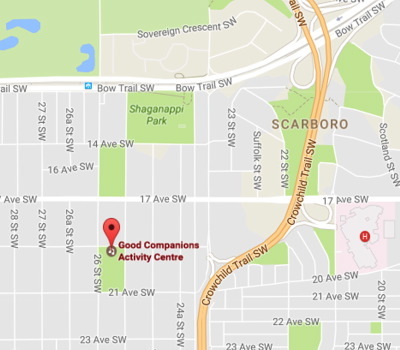 Starting in April, 2017 the new location for CAS meetings will become the Good Companions Activity Centre at 2609 - 19 Avenue S.W. Please note that meetings are NOT held in June, July, August or December. The December meeting is replaced by the Christmas party. The January meeting may be held on the second Thursday of the month if there is a conflict with New Year's day. There is normally NO critique done at the end of the September meeting, so please do not bring artwork that month.